Thinking of what to give your lovebug this Valentine's? Of course you can express love any day and every day of the year, but let's make extra special this time around. So for those who love their gadgets and like matching it with their personality to express themselves, Beyond The Box has something for you! Beyond the Box is an Apple Premium Reseller that follows Apple's philosophy of 'Thinking Differently.' More than just a gadget store, it enables people to go beyond their boxes by helping them express themselves in creative ways. This Valentine's, love comes in pairs at Beyond the Box. 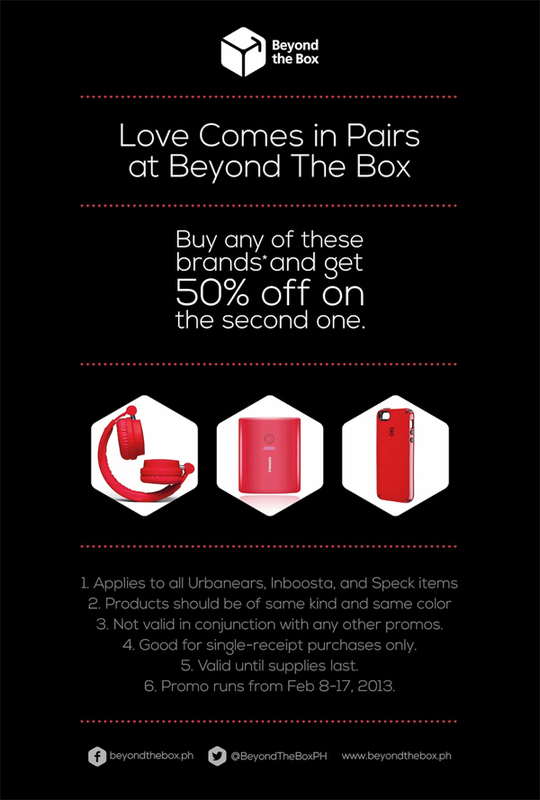 If you buy any product of Inboosta, Urbanears, or Speck, you can get a second one for someone special at 50% off. This deal is available until February 17, 2013 at all Beyond the Box Stores. Awesome post, loving those headphones so cute!